Located in the top of the Rocky Mountains is Rendezvous Country, Land of the Sky Blue Water. High mountains mirrored in the turquoise waters of Bear Lake and valleys, traversed by the meandering Bear River, provide a striking physical setting for a historical heritage boasting of cowboys, Indians, mountain men and hearty pioneers. 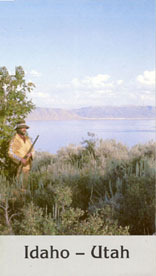 Native Americans prized the the Bear Lake valley as prime hunting ground as well as a meeting place. It was such a gathering in 1819 that Donald McKenzie first saw and named the area for the abundance of black bears. Black Bears Lake, quickly shortened to Bear Lake, was the site of two fur trader-trapper Rendezvous held during the summers of 1826 and 1827. Such notables as Jedediah Smith, Jim Bridger, William Ashley and Tom Fitzgerald were in attendance. The south end of the valley was described as a “lighted city” at one of these gatherings where fur traders, Indians and suppliers met to trade for traps, supplies and furs. Pathfinders John C. Fremont and Captain Bonneville wrote of their findings in the Bear Lake valley. Fremont was responsible for naming mountain peaks, canyons and streams in the area. The Preuss Mountain range was named after his topographer. Bonneville wrote of the huge marsh located north of Bear Lake. The accounts of pathfinders and fur traders led Oregon-bound emigrants into the Bear Lake valley by way of the Thomas Fork valley. U.S. Highway #30 North basically follows the old Oregon/California Trail. Many wagon trains stopped at Thomas L. “Peg Leg” Smith’s trading post located near Dingle, Idaho for supplies and trading stock. One traveler wrote of camping along the cottonwood-lined Bear River watching grass, tall as a man, wave in the wind. Charles C. Rich led Mormon pioneers into the Bear Lake valley in September of 1863 and established the fledgling community of Paris, Idaho. Other communities were quickly established within the next few years. Accounts are told of hearty pioneers struggling with the harsh and diverse climate. The valley soon prospered as a farming and ranching area. Montpelier, Idaho, growing from the coming railroad, phosphate mining and other elements, became increasingly important in the economy of the valley. The small farming communities around Bear Lake are giving way to recreational development. Summer home sites dot the hillsides around the lake. Recreational developments promise vacations accented by the sparkling waters of Bear Lake. Skiing, snowmobiling, sailing and swimming are offered to the recreationist. Prime hunting and fishing areas are located within the “Greater Bear Lake Valley”, whether its trout fishing in the streams, ice fishing for “Cisco”, hunting deer or seeking elk along the high mountain ridges. This scenic corner of Idaho and Utah offers outdoor recreation and historical interests away from crowds and high prices. Mountain Man picture and text used courtesy from a tourist brochure sponsored by the Idaho Travel Council, County of Bear Lake, Idaho Department of Parks and Recreation, U.S. Forest Service and the Greater Bear Lake Valley Chamber of Commerce. Fur trappers and mountain men gather together on the southern shores of Bear Lake to trade supplies, furs and conversation. Rendezvous Beach between Garden City and Laketown, Utah honors the memories of these sturdy early visitors to the valley. Oregon/California Trail emigrants rested at the Clover Creek Encampment in present-day Montpelier after descending the difficult Big Hill. Scenes like these are re-created at the National Oregon/California Trail Center in Montpelier, Idaho. 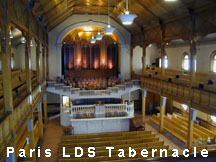 After arriving in the valley, the Mormons created townships reflecting their european roots such as Bern and Geneva (Switzerland), Georgetown (England, although named after Mormon leader George Q. Cannon) and St. Charles (England), and Paris (France, although named after Brigham Young’s friend Thoms E. Perris who surveyed the town). Montpelier; however, was not named after the town in France, but by Brigham Young after a town in his native birth state of Vermont. He also named Bennington and Ovid after similar towns in Vermont. Pioneer Historic Byway in the Southeast Idaho – Travel the trails of the early Mormon Pioneers. Visit Historic Monuments. Take a road trip through the Bear River Heritage Area that straddles the Idaho-Utah border. It is home to a strong agricultural economy, history-laced landscape, and abundant natural beauty. Retrace the footsteps of early fur traders, Mormon settlers, and generations of the Northwestern Band of the Shoshone Nation. Butch Cassidy and his gang robbed the Bank of Montpelier at 3:13 pm on August 13, 1896 after the 13th deposit in the amount of $13.00, then raced out of town.